Do please keep us updated as they are tested and evolve. Sorry about the Bug issue, here is a link to the post with the rules for anyone who wishes to give the a go, or just a look. Our group here tried the 3 ranks of figures vs. 2 ranks and if the units have enough figures in them then it looks good otherwise it really doesn't have the impact you're trying to achieve. I would forgo the different mounting systems and just have variations in the rules to account for the different formations if you think that really did matter during this period. One thing to think about is by having the same mounting system for both sides will make it easier to build units and later if you grow tired of them – put them up for sale! Sorry lost me on rolling lots of dice and hits and saves. There are lot of much better and faster ways to do this. Actually both sides use the same sabot base, it is a 2"x3" rectangle with six holes (my miniatures are based on pennies). Dutch system troops use the wide side of the base as a front edge, French style troops use the narrow side. 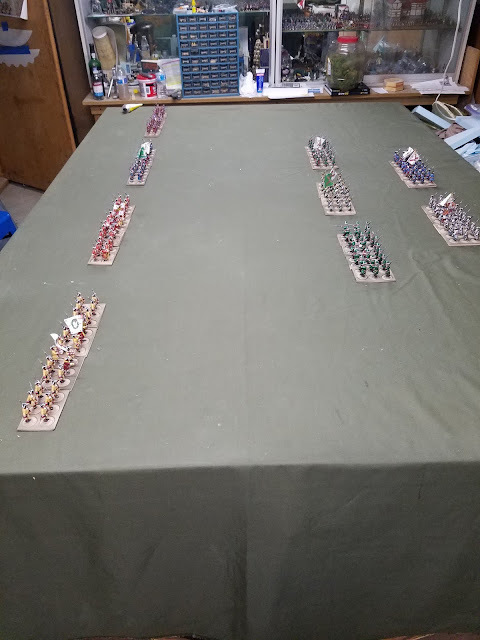 I think it gives the most flexibility (I also use these figures for a Siege of Saint Augustine game using Pikeman's Lament and a 1/50 scale model of the Castillo de San Marcos) while clearly representing the much narrower frontage of French units. I'm sorry that you feel that way. The groups of gamers that I play with enjoy rolling loads of dice. I find that the larger number of dice average-out results so tactics and planning matter more than the odd bad die roll. Saves only apply to troops in cover and is the most direct method of handling that issue. The other day I taught these rules to three gamers who had never seen the rules before. We played a game involving twenty-one units to a conclusion in less than three hours with frequent interruptions for banter and libations. I don't see a problem of speed here. Please remember that I'm not trying to produce a marketable set of rules, just an Old School sort of set with a high level of granularity, which is what my fellow gamers like.